Foreign direct investment (FDI) continues to expand rapidly, enlarging the role of international production in the world economy. FDI grew by 18 per cent in 2000, faster than other economic aggregates like world production, capital formation and trade, reaching a record $1.3 trillion (table 1). 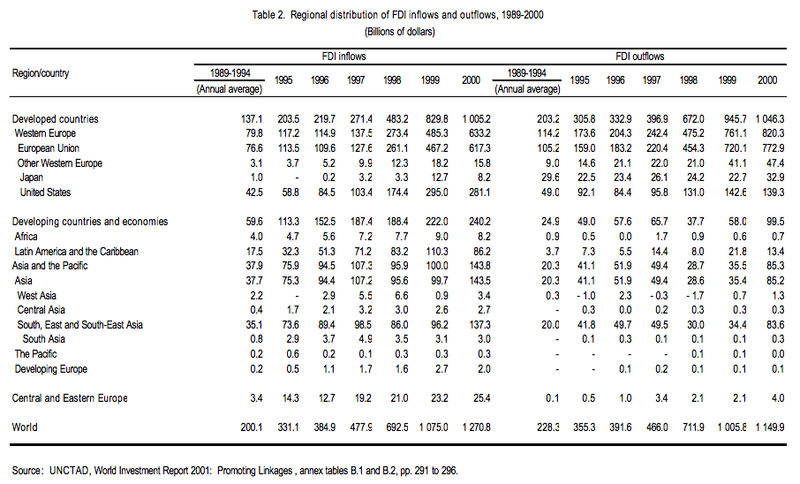 FDI flows are, however, expected to decline in 2001. The global expansion of investment flows is driven by more than 60,000 transnational corporations (TNCs) with over 800,000 affiliates abroad. Developed countries remain the prime destination of FDI, accounting for more than three-quarters of global inflows. Cross-border mergers and acquisitions (M&As) remain the main stimulus behind FDI, and these are still concentrated in the developed countries. As a result, inflows to developed countries increased by 21 per cent and amounted to a little over $1 trillion. FDI inflows to developing countries also rose, reaching $240 billion. However, their share in world FDI flows declined for the second year in a row, to 19 per cent, compared to the peak of 41 per cent in 1994. The countries in Central and Eastern Europe, with inflows of $27 billion, maintained their share of 2 per cent. 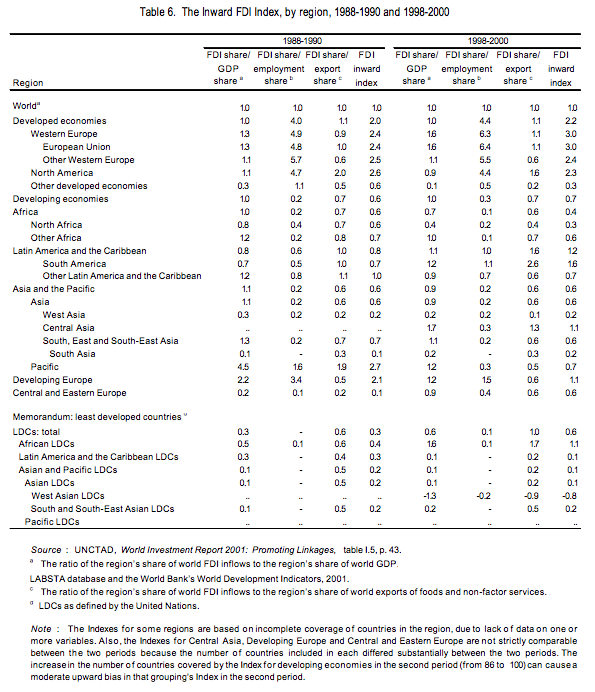 The 49 least developed countries (LDCs) remained marginal in terms of attracting FDI, with 0.3 per cent of world inflows in 2000. 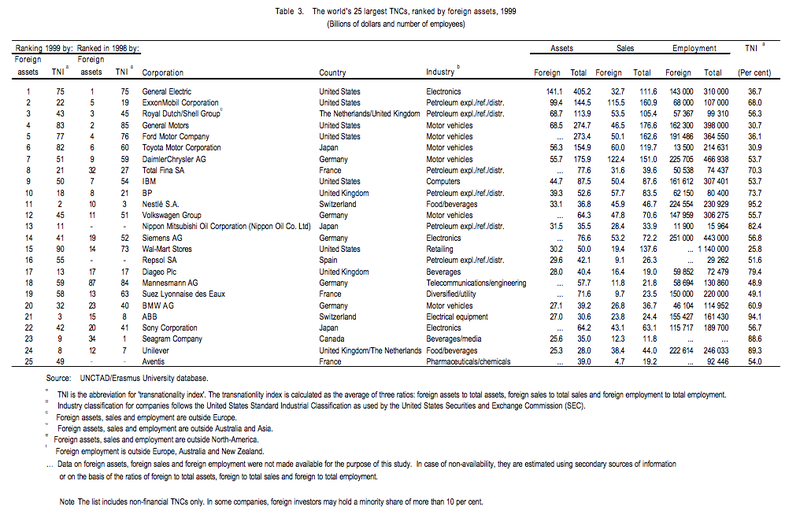 Within the developed world, the Triad – the European Union (EU), the United States and Japan – accounted for 71 per cent of world inflows and 82 per cent of outflows in 2000 (table 2). Within the Triad, the EU has gained both as a recipient and source of FDI. Record inflows ($617 billion) were stimulated by further progress in regional integration, while the United States and other Western European countries remain its main partners outside the region. Due to the take-over of Mannesmann by VodafoneAirTouch – the largest crossborder merger deal so far – Germany became, for the first time, the largest recipient of FDI in Europe. The United Kingdom maintained its position as the top source country worldwide for a second year. The United States remained the world’s largest FDI recipient country as inflows reached $281 billion. Outflows with $139 billion decreased by 2 per cent. Japan saw its inflows in 2000 drop by 36 per cent from the previous year to $8 billion, partly due to the prolonged slow-down of the country’s economic growth, but also perhaps indicative of the fact that, in spite of its welcoming FDI policies, other factors deter investment inflows. In contrast, outflows from Japan rebounded to $33 billion, the highest level in ten years. Among other developed countries, the most conspicuous events were the unprecedented levels of FDI into and from Canada, reflecting several major M&A deals, in particular with partners in Europe and the United States. There were major differences in FDI trends among developing countries. In contrast to the experience in most other parts of the world, inflows to Africa (including South Africa) declined in 2000 (for the first time since the mid-1990s), from $10.5 billion to $9.1 billion. As a result, the share of Africa in total FDI flows fell below 1 per cent. The decline was mainly related to two countries: South Africa and Angola. In the former country, fewer privatization and M&A deals caused the slow-down, while in the latter, inflows in the petroleum sector declined. The Southern African Development Community maintained its position as the most important subregion for FDI inflows in Africa. Its share in total FDI inflows into Africa was 44 per cent, compared to 21 per cent in the first half of the 1990s. The Community’s improved attractiveness to FDI may have been principally driven by country-specific factors, but at least some FDI inflows were also motivated by the economic integration of the region. After tripling during the second half of the 1990s, FDI flows into Latin America and the Caribbean also fell in 2000, by 22 per cent, to $86 billion. This was mainly a correction from 1999 – when FDI inflows into the region were greatly affected by three major cross-border acquisitions of Latin American firms – rather than a shift in the underlying trend. 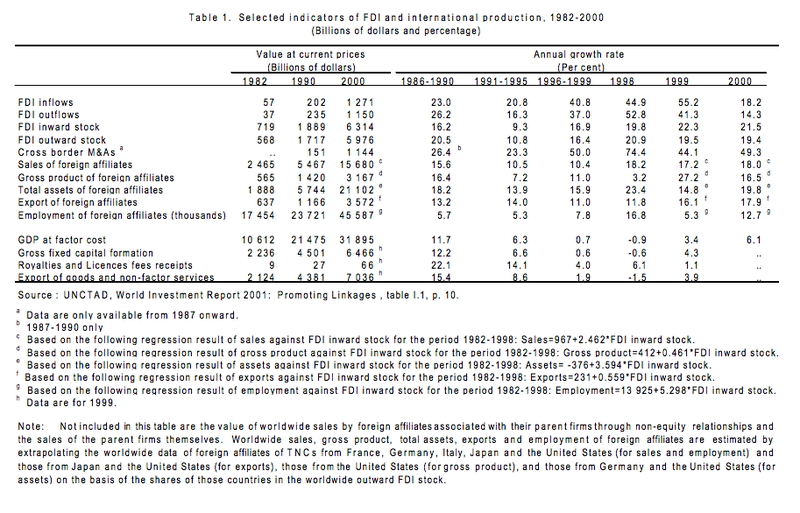 Privatization slowed down in 2000, but continues to be important as a factor driving inward FDI. In terms of sectors, FDI into South America was mainly in services and natural resources, while Mexico continued to receive the largest share of inflows in manufacturing as well as in banking. In developing Asia, FDI inflows reached a record level of $143 billion in 2000. The greatest increase took place in East Asia; Hong Kong (China), in particular, experienced an unprecedented FDI boom, with inflows amounting to $64 billion, making it the top FDI recipient in Asia as well as in developing countries. This upsurge in inflows has several explanations. First, it reflects a recovery from the economic turmoil of the recent past. Second, TNCs planning to invest in mainland China have been “parking” funds in Hong Kong (China), in anticipation of China’s expected entry into the WTO. Third, the increase reflects a major cross-border M&A in telecommunications, which alone accounted for nearly one-third of the territory’s total FDI inflows. Fourth, there is an element of increased “round-tripping” of capital flows into, and out of Hong Kong (China). FDI flows to China, at $41 billion, remained fairly stable. In the course of its negotiations for membership in the WTO, China has amended some of its FDI policies. TNCs play an increasingly important role in the Chinese economy; for example, tax contributions by foreign affiliates accounted for 18 per cent ($27 billion) of the country’s total corporate tax revenues in 2000. Inflows to South-East Asia (ASEAN-10) remained below the pre-crisis level. The subregion’s share in total FDI flows to developing Asia continued to shrink, and stood in 2000 at 10 per cent, as compared with over 30 per cent in the mid-1990s. This was largely due to rising inflows into other countries in the region and significant divestments in Indonesia since the onset of the financial crisis. South Asia witnessed a drop in FDI inflows by 1 per cent over the previous year. A mapping of FDI inflows indicates the extent to which host countries are integrating into the globalizing world economy. It also indicates indirectly the distribution of benefits from FDI. The mapping of outward FDI shows which countries control the global distribution of this investment. Understanding the pattern of FDI flows and stocks and its driving forces is important for the formulation and implementation of economic strategies and policies. A comparison of the world maps of inward and outward FDI in 2000 and 1985 reveals that FDI reaches many more countries in a substantial manner than in the past. More than 50 countries (24 of which are developing countries) have an inward stock of more than $10 billion, compared with only 17 countries 15 years ago (7 of them developing countries). The picture for outward FDI is similar: the number of countries with stocks exceeding $10 billion rose from 10 to 33 (now including 12 developing countries, compared to 8 in 1985) over the same period. In terms of flows, the number of countries receiving an annual average of more than $1 billion rose from 17 (6 of which were developing countries) in the mid-1980s to 51 (23 of which were developing countries) at the end of the 1990s. In the case of outflows, 33 countries (11 developing countries) invested more than $1 billion at the end of the 1990s, compared to 13 countries (only one developing country) in the mid-1980s. Despite its reach, however, FDI is unevenly distributed. The world’s top 30 host countries account for 95 per cent of total world FDI inflows and 90 per cent of stocks. The top 30 home countries account for around 99 per cent of outward FDI flows and stocks, mainly industrialized economies. About 90 of the world’s largest 100 non-financial TNCs in terms of foreign assets are headquartered in the Triad (see table 3 for the top 25 of those firms). More than half of these companies are in the electrical and electronic equipment, motor vehicle, and petroleum exploration and distribution industries. These TNCs play an important role in international production: they accounted (in 1999) for approximately 12 per cent, 16 per cent and 15 per cent of the foreign assets, sales and employment, respectively, of the world’s 60,000 plus TNCs. General Electric maintained in 1999 its position as the largest TNC in the world. For the first time, three companies from developing countries (Hutchison Whampoa, Petróleos de Venezuela and Cemex) are among the world’s 100 largest TNCs. The transnationalization of companies is a phenomenon increasingly observed not only in developed countries but also in the developing world. The top 50 TNCs from developing countries – the largest of which are comparable in size to the smallest of the top 100 worldwide – originate in some 13 newly industrializing economies of Asia and Latin America as well as in South Africa (see table 4 for the top 10 of those firms). They congregate in construction, food and beverages, and diversified industries. The largest 25 TNCs from Central and Eastern Europe are somewhat more evenly distributed among nine home countries (see table 5 for the top 10 of those firms). Transport, mining, petroleum and gas and chemicals and pharmaceuticals are the most frequently represented industries among these TNCs. The transnationality index for the three groups of TNCs shows some divergent patterns. The degree of transnationalization increased for both the top 50 TNCs and the top 25: from 37 per cent in 1998 to 39 per cent in 1999 in the case of the former; and from 26 per cent to 32 per cent in the case of the latter. The transnationality of the top 100 TNCs remained fairly stable at a high level (53 per cent). The locational patterns of international production differ by country and industry, and they change over time, partly in response to the shifting industrial composition of FDI. During the past ten years, services have become more important in international production because this sector has been liberalized for FDI relatively recently. In 1999, they accounted for more than half of the total stock of inward FDI in developed countries and some one-third of that in developing countries. In many service industries, FDI tends to be spread relatively widely, reflecting the importance of proximity to customers. The same applies to some manufacturing industries, in which access to the domestic market is the predominant reason for investing abroad. However, the more advanced the level of technology in an industry, the higher the level of concentration tends to be. For example, if one takes six industries representing different technological levels (semiconductors, biotechnology, automobiles, TV and radio receivers, food and beverages, and textiles and clothing), an industrial mapping shows FDI in biotechnology as highly concentrated (figure 1), followed by semiconductors and televisions and radio receivers. In comparison, the food and beverages industry is more evenly spread among host countries (figure 2). Foreign affiliates in high-technology industries tend to agglomerate in selected locations in the world. This reflects differences in the industrial distribution of FDI in the manufacturing sector between developed and developing countries. In the developed countries, chemicals is the largest recipient industry, while in developing countries FDI is concentrated in low-technology industries. At the functional level, geographical patterns of FDI reflect efficiency considerations of TNCs in the light of increasing competitive pressures, coupled with technological advances that enable real-time links across long distances and the liberalization of trade and FDI policies. This encourages a greater spread of all corporate functions. Even such critical corporate functions as design, R&D and financial management are today becoming increasingly internationalized to optimize cost, efficiency and flexibility. Take, for example, the location of regional headquarters. Singapore and Hong Kong (China) have attracted a number of regional headquarters to serve the Asian region, with the first location hosting some 200 regional headquarters, and the second 855 in 2000. In some industries, TNCs have set up integrated international production systems with an intra-firm international division of labour spanning regions (as in automobiles) or continents (as in semiconductors). Within such complex systems, the functions transferred to different locations vary greatly. Less industrialized locations are assigned simpler tasks like assembly and packaging, while more skill- and technology-intensive functions are allocated to industrially more advanced locations. …with countries varying greatly in terms of their success in attracting FDI, as revealed in the new Inward FDI Index. The concentration of FDI reflects the concentration of economic activity more generally. Thus, exports, domestic investment and technology payments are also highly concentrated. Richer and more competitive economies naturally receive and send more international direct investment than other economies. To gauge the underlying attractiveness of a country for international investors, it is useful to take its relative economic size and strength into account. The Inward FDI Index captures the ability of countries to attract FDI after taking into account their size and competitiveness. The Index is the average of three ratios, showing each country’s share in world FDI relative to its shares in GDP, employment and exports. An index value of “one” would therefore mean that a country’s share in world FDI matches its economic position in terms of these three indicators. The ranking of 112 countries in 1988-1990 and 137 in 1998-2000 shows a large dispersion of index values. For 1998-2000, the value of the Index ranges from 17.3 for the leading economy, Belgium and Luxembourg, to -0.8 for Yemen. Moreover, the rankings have changed significantly over time. Singapore has slipped from first position at the end of the 1980s to thirteenth position a decade later. The fall in its index value reflects a slower growth of FDI (by about a half) than in its GDP and exports which more than doubled between the two periods. The position of Sweden has improved considerably (moving from the twenty-ninth spot to the fourth), partly reflecting a deliberate change in policy during the 1990s in favour of greater openness towards inward FDI. In 1998-2000, there were five countries with an Inward FDI Index value of one: Costa Rica, El Salvador, Hungary, Malaysia and Slovakia. There were 53 countries with a value higher than one, and 79 with values lower than one. The last group, which “under-performs” in terms of attracting FDI, includes advanced economies like Japan, Italy and Greece, newly industrializing economies like the Republic of Korea, Taiwan Province of China and Turkey, oil rich economies like Saudi Arabia and a number of low income countries. FDI recipients with high values of the Index include the majority of the developed countries, Hong Kong (China), Singapore and some Central and Eastern European countries. In both periods, the Index value for developed countries is about twice the world average, while those for developing countries and economies in transition are below the world average (table 6). The differences between the three groups of countries reflect mainly the influence of the employment variable: the developed and developing country groups have FDI shares roughly in proportion to their GDP shares, but the former receive far larger shares of world FDI than their shares in world employment, while developing countries and economies in transition receive less. Within the developing world, the Inward FDI Index values for South America and Central Asia exceeded unity in 1998-2000. In the other regions (and for these two regions in the earlier period), the Index value was below one. South Asia, West Asia and North Africa show the lowest values; the reasons for this may have more to do with political factors than economic ones. Sub-Saharan Africa receives FDI in line with its GDP share, but very little in relation to its share in employment; over time its FDI Index value has declined slightly. For the LDC group, the value of the FDI Index doubled between the two periods, mostly due to increases in the FDI to exports and FDI to GDP ratios. In fact, in the second period, the Index value for African LDCs exceeded one; it is now almost twice as high as that for sub-Saharan Africa as a whole. The index value for other LDCs has declined over the decade. The Index suggests that Africa receives less FDI flows in comparison with the region’s relative economic size. The underlying economic reality is that sub-Saharan Africa has lost share in both world FDI inflows and other economic aggregates; African LDCs, however, have maintained their share of FDI but have fallen further behind in other economic aggregates. Interpreting the Inward FDI Index calls for care and the use of evidence on other economic and policy variables. Nonetheless, it can provide a starting point for benchmarking how countries succeed in attracting FDI. Many of the countries at the top of the ranking (with an index value far exceeding unity) are strong economies that are leveraging their economic strength through policies to attract more than their “normal” share of FDI. There are also, however, a few countries with weak economies but strong natural resource endowments that occupy places at the top. A number of countries at the bottom are weak economies in which the influence of other economic factors and policies apparently pulls inward FDI below levels that could be expected on the basis of the elements of economic strength covered by the Index. There are others at the bottom, (such as Japan and the Republic of Korea), however, that have strong economic positions overall but have chosen to restrict FDI (at least until fairly recently). The rapidly changing international setting is changing the drivers of FDI. While the main traditional factors driving FDI location – large markets, the possession of natural resources and access to low-cost unskilled or semi-skilled labour – remain relevant, they are diminishing in importance, particularly for the most dynamic industries and functions. As trade barriers come down and regional links grow, the significance of many national markets also diminishes. Primary industries account for a shrinking share of industrial activity, and natural resources per se play a smaller role in attracting FDI for many countries. The role of cheap “raw” labour is similar: even labour-intensive activities often need to be combined with new technologies and advanced skills. The location of TNC activity instead increasingly reflects three developments: policy liberalization, technical progress and evolving corporate strategies. Changes in the international policy environment have a strong impact on locational decisions. Trade and investment liberalization allows TNCs to specialize more and to search for competitive locations. TNCs have greater freedom to choose locations and the functions they transfer. Between 1991 and 2000, a total of 1,185 regulatory changes were introduced in national FDI regimes, of which 1,121 (95 per cent) were in the direction of creating a more favourable environment for FDI (table 7). During 2000 alone, 69 countries made 150 regulatory changes, of which 147 (98 per cent) were more favourable to foreign investors. Technical progress affects the geography of FDI in many ways. Rapid innovation provides the advantages that propel firms into international production. Thus, innovation-intensive industries tend to be increasingly transnational, and TNCs have to be more innovative to maintain their competitiveness. Innovation also leads to changes in the structure of trade and production, with R&D-intensive activities growing faster than less technology-intensive activities. The increased technology intensity of products reduces the importance of primary and simple low-technology activities in FDI, while raising that of skill-intensive activities. New information and communication technologies intensify competition while allowing firms to manage widely dispersed international operations more efficiently. High-technology activities previously out of reach of developing countries can now be placed there because labour-intensive processes within those activities can be economically separated and managed over long distances. Many activities in integrated production systems are technology-intensive and dynamic; their location in developing countries can rapidly transform the FDI and competitive landscape there. Moreover, the pervasiveness of technical change means that all TNC activities have to use new technologies effectively. Location decisions have to be based on the ability of host countries to provide the complementary skills, infrastructure, suppliers and institutions to operate technologies efficiently and flexibly. Technical progress, thus, forces firms involved in international production to differentiate increasingly between the “haves” and “have-nots” in new FDI-complementing factors when deciding where to undertake different activities. core competencies, with flatter hierarchies and stronger emphasis on networking, steers investments towards locations with advanced factors and institutions, and, where relevant, distinct industrial clusters. New organizational methods (aided by new technologies) allow a more efficient management of global operations, encouraging a greater relocation of functions. Intense competition forces firms to specialize in their core business, inducing TNCs to forge external links at various points along the value chain (from design and innovation to marketing and servicing) and allow other firms (including TNCs) to undertake different functions. Hence, the changing geography of international production reflects the dynamic interaction of many economic, organizational and policy factors. While many of these factors have long been relevant, their combination today represents new forces influencing TNC location decisions. To cope successfully with globalization and use FDI to their advantage, developing countries must understand these forces. They set the parameters within which policy makers have to act, to attract FDI and to extract the greatest benefits in terms of technology, skills and market access, striking backward linkages and leveraging foreign assets to reach competitive positions in global markets. The growing spread and mobility of TNCs are making local conditions more, not less, important. The increased freedom for factors and functions to move does not mean that international production spreads equally to all locations. Mobile factors only go and “stick” in places where efficient complementary factors exist. Thus, FDI tends to be fairly concentrated geographically within countries, responding to the agglomeration economies that also influence domestic firms. These economies relate to proximity to markets and factors of production, and the availability of specialized skills, innovatory capabilities, suppliers and institutions. Intensifying competition forces firms to specialize more in their core competencies and rely more heavily on links with external partners (suppliers, buyers or even competitors) than in the past. These networking possibilities often induce TNCs to set up operations in close proximity to (competent) clusters of related firms. Industrial clusters are playing an increasing role in economic activity, particularly in technology intensive activity. “Clusters” are concentrations of firms in one or a few industries, benefiting from synergies created by a dense network of competitors, buyers and suppliers. Clusters comprise demanding buyers, specialized suppliers, sophisticated human resources, finance and well-developed support institutions. Such concentrations of resources and capabilities can attract “efficiency-seeking” FDI (and more and more FDI is of this type). It also helps to attract “asset-seeking” FDI to the more advanced host countries. In their inexorable search for new competitive advantages, TNCs seek “created assets” such as technology and skilled labour across the globe. Clusters of innovative activity (as in Silicon Valley in California, Silicon Fen in Cambridge (United Kingdom), Wireless Valley in Stockholm or Zhong Guancum, a suburb of Beijing) have a distinct advantage in attracting such (high value) FDI. These shifts in location factors pose important policy challenges for developing countries. Many countries, in particular the poorer and least industrialized ones, risk becoming even more marginal to the dynamics of international production because they cannot meet the new requirements for attracting high quality FDI. Simply opening an economy is no longer enough. There is a need to develop attractive configurations of locational advantages. Different configurations of advantages attract different corporate functions and industries. In some high-technology industries like electronics, it may be possible to attract final-stage assembly on the basis of cost-efficient semi-skilled labour and efficient export-processing facilities. In other activities, production facilities may require well-developed local supply chains, a pool of skilled labour, close interaction with other firms and knowledge-producing institutions in close proximity. Some back-office activities may require specialized skills (e.g. in accounting). High value functions like R&D or regional headquarters are particularly demanding of advanced skills and institutions. Investors – domestic and foreign alike – seek to take advantage of dynamic clusters. In joining a cluster, they often add to its strength and dynamism. This, in turn, tends to attract new skills and capital, adding further to the dynamism of the location. Where agglomeration economies are significant, the rest of the country might be of little relevance to the locational decisions of firms. Hence, attracting FDI in these activities depends increasingly on the ability to provide efficient clusters. An international bank’s location choice is not so much a choice between the United Kingdom and Germany as between London and Frankfurt. Just like competitive firms differentiate themselves from their rivals by developing clearly identifiable products with recognizable brand names, some countries, too, can, over time, identify and develop their distinct “investment products”, and market them to foreign investors. For example, Bangalore in India has become a “brand name” for the development of software, with its pool of highly skilled engineers and competitive software companies. Singapore and Hong Kong (China) enjoy a similar status in the area of financial services and regional headquarters in Asia. …which calls for a new generation of investment promotion policies. Using and strengthening clusters to attract FDI calls for new approaches, going beyond the first and second generations of investment promotion policies. In the first generation of investment promotion policies, many countries adopt market friendly policies. They liberalize their FDI regimes by reducing barriers to inward FDI, strengthening standards of treatment for foreign investors and giving a greater role to market forces in resource allocation. Virtually all countries – to varying degrees – have undertaken steps in this direction. Some countries, can go a long way in attracting FDI with these steps, if the basic economic determinants for obtaining FDI are right. In the second generation of investment promotion policies, governments go a step further and actively seek to attract FDI by “marketing” their countries. This approach leads to the setting up of national investment promotion agencies. The World Association of Investment Promotion Agencies, established in 1995, now has over 100 members. Again, of course, the success of proactive efforts depends, in the end, on the quality of the basic economic factors in a host country. The third generation of investment promotion policies takes the enabling framework for FDI and a proactive approach towards attracting FDI as a starting point. It then proceeds to target foreign investors at the level of industries and firms to meet their specific locational needs at the activity and cluster level, in light of a country’s developmental priorities. Such a strategy, in turn, is greatly helped if a country can nurture specific clusters that build on the country’s competitive advantages, capitalizing on the natural inclination of firms to agglomerate and that eventually acquire a brand name. A critical element of such investment promotion is to improve – and market – particular locations to potential investors in specific activities. Of course, a country’s general economic, political and regulatory features also matter, because they affect the efficiency of the clusters within it. But the key to success of such new investment promotion strategies is that they actually address one of the basic economic FDI determinants while understanding the changing location strategies of TNCs. However, such a targeted approach, especially the development of locational “brand names”, is difficult and takes time. It requires fairly sophisticated institutional capacities. Third generation promotion is, nevertheless, growing in practice, as witnessed by the proliferation of sub-national agencies (of which a minimum of 240 exist today) and even municipal investment promotion agencies. This gives rise to another challenge: the need to coordinate policies across various administrative levels in a country. If that is not done, there is a risk that competition among regions within a country leads to “fiscal wars” and results in waste as far as the welfare of the country as a whole is concerned. It also raises the risk that promotion agencies, if they are unable to coordinate other policy-making bodies in the country, will be unable to deliver on their promises to investors. Regardless of the level at which FDI is promoted – and regardless of the precise mix of the three basic investment strategies that is being pursued – the competitiveness of the domestic enterprise sector and a pool of skilled people are the key to the “product”. Strong local firms attract FDI; the entry of foreign affiliates, in turn, feeds into the competitiveness and dynamism of the domestic enterprise sector. The strongest channel for diffusing skills, knowledge and technology from foreign affiliates is the linkages they strike with local firms and institutions. Such linkages can contribute to the growth of a vibrant domestic enterprise sector, the bedrock of economic development. For developing countries, the formation of backward linkages with foreign affiliates therefore assumes particular importance. The challenge then is how to promote backward linkages – regardless of the type of investment promotion policy a country pursues. FDI flows reached record levels in 2000… ...but a mapping of the geography of FDI patterns shows that international production is highly concentrated… …with countries varying greatly in terms of their success in attracting FDI, as revealed in the new Inward FDI Index. The expansion of international production is taking place in a new international setting... ...and leads to a concentration at the sub-national level as well... …which calls for a new generation of investment promotion policies.